No Pressure Sales, from Omilia! Being 5’ tall I’m challenged finding a vehicle that fits my petite frame. She found a perfect vehicle for me! In the last 9 months I have visited a lot of dealerships and have found few vehicles that I can drive. When I’m ready to purchase I’ll buy a V.W from her. Her no pressure way of selling was refreshing. It was a wonderful experience, overall. She is pleasant and extremely knowledgeable about cars. I ended up purchasing from another dealership, but only because they had the specific car I wanted. I have purchased three cars from Jordan/Lithia, and would highly recommend. Omelia was a wonderful Rep! She was personable and very helpful when it came to getting me into the right vehicle! I would recommend this dealership and Omelia to anyone I know looking for a great car and friendly face!! I had a great experience there at Volkswagen. They fixed all of the issues I had with the car right away. When I first started looking she helped me deal with some problems I was having with another dealer. She was so very sweet and helpful! Marie was outstanding and did a great job assisting me with the used car I purchased. She also communicated well throughout the entire process. She was transparent about the pricing of the vehicle as well as for the pricing of my trade. I would definitely use her again. Great customer service Marie! We had a generally great experience purchasing our new car from Lithia. Mitchell was very quick to respond to all emails I had prior to heading into the dealership. Our time at the dealership was a bit rough, as it ended up being a very busy day for them, but Omelia eventually stepped in and helped to keep the process moving. Despite the hiccup, the staff made up for it in the end and my wife and I were very happy. I would definitely recommend Lithia to anyone, and definitely point them to Mitchell or Omelia! Helpful, professional, and very knowledgeable. I would recommend Ms. Terronez to friends and family. Will definitely be back for vehicle maintenance and future vehicle purchases! I stopped in to browse and Marie was very helpful even knowing I wasn’t going to buy that day. Her customer service skills are outstanding and she listened intently to my questions and gave me detailed answers. I’ll be back to make my purchase soon! I had an amazing experience with this sweet woman! She was very helpful and took all of the time we needed to answer our questions and help us find what we needed! We will be sending all of our friends to her! Great help and follow up! I’m not quite ready for the buying processes but Omelia took the time to educate me on what’s best For my needs and price range. She also has been following up with me and any needs I may have and such a great asset to this company! I’ve never had a better car buying experience. She made buying a car fun. I would recommend anyone looking for a vehicle to seek Omelia out. You will not regret it and you won’t have to shop around. She put me in the right car to fit all my needs. Never fun but everyone was working to get things done quickly and easily. Didn’t have to go through the game playing some dealers pull. Maria was absolutely wonderful to work with. Team behind the scenes gave off a bully vibe and struggled to listen to Maria, from my perspective. Went in looking for a certified used vehicle, and got into a brand new one for only a little bit more money. Omelia was very helpful along the way. Was talking to a dealership in Minnesota at the same time, and they could only get to within $2,000 of the price I was able to get here. Great Experience and Great Car! Ms. Terronez and Lithia VW did a great job, they were fair to deal with, pleasant, and helpful. My new car was ready for me to pick up right on time. I highly recommend them, and Ms. Terronez in particular. She was great! My fiancé came into the dealer looking to get into a new Tiguan at a great price and Omelia and the wonderful team there did exactly that. We’ll return and refer everyone we can because the service is just that great!! Omelia was great to help with both the sale and post-sale process. She and VW Service went above and beyond with a post-sale issue. I very much appreciate it! I don't love buying new cars, but the process went super well with Omelia. Thanks! Omelia was great to work wit’s. Took the time to understand my goals and interests for buying a new car and helped out as much as she could. Maria made sure that my daughter and I were highly satisfied and we were very happy and grateful for her help with our new car. Everyone in the dealership went out of there way to make sure they found the right car for me. They even went out of state to get it and didn’t charge me extra. I will start by saying I am happy with my vehicle now that it is home and working. To get to this point though there were frustrations. We went to the dealership wanting to see a specific vehicle and had a great experience test driving it with Marie. Once we got back to the dealership though they continued to waste our time trying to sell it to us for more than we said we would pay. I understand that this is part of the process, but wasting hours of my time right before Christmas with family in town is obnoxious and rude. When we finally got the price down and paid for it I went to drive the car off the lot and it said it was not recognizing the key and would not start. I went inside and Marie was kind and went to find out what was going wrong. The “guys in the back” didn’t come out to look at it or make me feel at ease that the vehicle I just purchased was not defective but told Marie to have me wave the key I front of the sensor and it would work. They also said that they had no issues driving it around the lot so they weren’t sure what happened. It felt as if they were saying I had somehow in the minute I owned the vehicle messed something up. The car started and I was able to drive it home that night, but the next day when I went to drive the car to the store it refused to start in my garage. Once again it said it didn’t recognize the key. This was a Sunday and the dealership was closed. I was able to text Marie and she was kind and said she would speak with the service department. The car had to be towed to the dealership and the service department shared that the keys needed to be programmed to the car, the batteries replaced, and a new car battery installed. These are minor things, but things that should have been done before we purchased the car and took it home. I was disappointed that no one on Saturday evening when we purchased the car and had issues with it starting and recognizing the key felt the need to come out and check the car and ensure it was ready to go. I’m thankful I wasn’t stranded somewhere with the car and that it was just stuck in our garage at home. The dealership through there actions made it seem that the only important part was the sale and it didn’t matter what happened after. Marie was very kind and tried to help as much as possible, but the individuals above her that she checked in with obviously did not care. Thankfully the experience with the service department was more positive and I feel confident the issue is corrected. Very thorough and kind. I had a great buying experience. Omelia was awesome to work with and had an approachable and friendly style. I would recommend her to my family and friends. We had an outstanding experience while purchasing our first Volkswagen Jetta. All of the staff at Lithia VW were friendly and helpful. We would recommend both the Jetta and this dealership. I went to the dealership and everyone was very helpful and with very little nonsense got me into the vehicle i wanted at the price i wanted. This rating is much given because of the way Marie terronez has helped my father and I. She has phenomenal customer service and was very kind ! She made sure we were going to be happy walking out of that dealership! Absolutely had the best experience with Lithia of Des Moines . Lamont Johnson was the bomb! He was awesome. Best buying experience ever! Lamont gave us everything we asked for. He went above and beyond! Excellent!!! Looked after me and is a nan of his word!!! Lamont Johnson is the man to get you onto your new vehicle. Honest, a man of his word. If Lamont cant get you into your vehicle no one can. Thank you, Lamont!!! They listened, they made suggestions, they respected our comments, they spoke plain English. Ten years ago I was one of the top Sales person in New England, working at a large Ford, Lincoln dealership. I will be dealing with this group again, they are what a dealership should be! I have been to a lot of dealers throughout my life, but the service I received at Lithia Volkswagen of Des Moines was beyond exceptional. My husband and I worked with Lamont Johnson and he was amazing, patient, and extremely courteous and helpful. I would highly reccomend. Lamont was so helpful and professional and he made my buying experience very pleasant. This is my second new vehicle purchase from Lithoa VW and its sales people like Lamont that keep me as a loyal customer. He is not only professional but he is very caring and will work hard to get you the very best deal he can. Thanks Lamont!!! Lamont was so detailed with his descriptions and really helped us understand everything! He was so fun at the same time, making us laugh and making the visit enjoyable. Highly recommend working with him and the Lithia dealership! Lamont and Jerry were very helpful and straight forward. They worked out an awesome deal for the car I loved! See them for all of your car shopping needs! Both Lamont Johnson and Dwayne Hill were very patient and helpful in working to help her purchase a VW Jetta she had leased for 3 years. Since her second language is English she was patiently helped to understand the process of purchasing her leased car. She left very satisfied with the process. Koudos to both gentlemen. I walked into the dealership and was immediately impressed. The staff was very friendly and Andrew was right at the door to greet me. I had very little hope that they were going to be able to help me but they surprised me and went to work very hard and diligently to surcome several obstacles to get me in something that I would be happy with and get me 1 step closer to a better place in life. Lithia has continuously provided us with poor service no matter the sales rep. We knew what car we wanted before we entered the dealership. Three days later we got the car at 5 pm in a snowstorm. We had to wait around for hours to see the finance person and the battery was dead in the car so the test drive was delayed. This is the only VW dealer in town so we are stuck if we want a VW. Lamont helped me when no other dealership would! He didn't give up until I got a car. Would recommend for anyone. Thanks Volkswagen lithia! Very friendly and concerned about taking care of my vehicle. I am very pleased that I had it serviced at Lithia. I will be back again when I need serviced again. Best used car buying experience ever!!!! Looked at this car online the night before. Called the next morning and talked to Lamont to see what we could do to hold this car till I could get there to look at it and drive it. He took care of that and I was able to come in that evening for the look and test drive. Lamont was an excellent salesman. Very easy to deal with, not pressuring or pushing the sale. Definitely knew his automobiles. Mostly concerned of what I thought about the vehicle and test drive. Also took the time to learn a little bit about me and my family and what the vehicle would be used for. Would definitely buy a new or used car from him again. Dwayne was also great to work with in financing/paperwork end of the sale. Lithia is probably happy to have both of these men!!!!!!!!!! Lamont was great to work with. I came in to test drive a GTI to make sure I would be ok with the purchase we had planned for my husband. He answered all my questions and shared a lot of the features that I wasn't aware of in the car. Lamont and Gerry were able to get us a deal that worked. There was a bit of a wait after we decided to purchase, as the dealership was busy that Saturday, but Dwayne made the paperwork go fast. Everyone was really helpful and tried to make it up to us for having to wait. I had a great experience at Lithia Volkswagen. Over the weekend I bought a VW GTI at Lithia Volkswagen and worked with Lamont Johnson. Overall, this was the best car buying experience I have had in my life. Lamont went above and beyond in every facet in educating and assisting me in the process. Dwayne, in financing, also went above and beyond to simplify the process. Together, they gave me a great deal for a great car. I am very happy with my experience. Lamont Johnson was very genuine & looked out for our best interest. We bought from Lamont seven years ago. We liked him then and looked him up to buy from him again. Clean friendly dealership respectful of our time schedule. Was very impressed with the Atlas as have been Toyota and Honda owners in the past. The six year warranty also impressed. We had cruise control installed on our new 2017 VW Tiguan Limited as the vehicle did not come with it. The install was professional. We live 2.5 hours away and the cruise worked flawlessly keeping the speed within about a mile or so on our Missouri hill country. Enjoyed working with lamont. Very friendly and knowledgeable. Explained all of the details of the car . Would come again to look for our next car. Lamont wasn't pushy...he helped out so much in dealing for the car that I wanted. He was funny and amazing to work with...kept me relaxed making such a big purchase. I would definitely come see him again when looking for another car! Lamont Johnson is more than just a car salesman he is truly a people’s person. He actually showed instead in the problems I was facing, he even stayed late and went out of his way to make sure I got the best VW dealer could offer me. Lamont was the freakin best. He worked with us on everything and got us in a car within a couple of hours. He really cared about us and didn’t just treat us like a commission check. He really is GREAT and anyone needs a car go see Lamont Johnson!!!!!! We decided to visit Volkswagen, as an afterthought, on our way to purchase a Kia down the road. We were immediately assisted by Trey and Lamont, who promptly showed us the two options that fit our criteria, a Tiguan and an Atlas. They were both very knowledgable about the vehicle specs and features. We ultimately decided on a Tiguan. The manager Scott was very helpful in clarifying the purchase process and pricing. Financing was smooth with Dwayne. Upon returning to the dealership for a minor issue (glue residue), Randall was willing and able to assist us promptly in Lamont's absence. I would highly recommend Randall, Lamont, or Trey to help you find the perfect vehicle that works for your family and budget. Lamont provided excellent sales service! Lamont was very professional and easy to work with. He did not display the "pushy" salesman stigma. I came in with the intent to purchase a car and the purchase was made with a hand shake in 1 hour. I highly recommend Lamont! Stivers Ford and Shottenkirk Chevrolet in Waukee should really take note on how to make a sale. Forever sold with Lamont at Lithia of Des Moines. they have the inventory i was looking for and the product was top notch. the less than positive... if you're not a patient person you will likely be frustrated. they seem to be lacking any sense of urgency once the papers are signed. in fairness, a voicemail the salesman left for me didn't actually get to my phone until 2 days later, so verizon has to take some of the blame. This is the 2nd Jetta that we have purchased in the last 2 years. Absolutely love the dealership and its sales staff. Process is easy and did not feel any pressure at all. Lamont was a very personable and a pleasure to work with he made time we spent there enjoyable. He was not high pressure or at least it didn’t feel that way. Best experience with a care “salesman “ we have had. I enjoyed my interaction and the attention received. Everything was explained to me and the transaction was fast. Lamont was very knowledgeable and extremely attentive. I recommend him and would use him again. I was impressed with the detail of trying to understand what I wanted in my vehicle. Most times dealerships try to push what is available rather than asking what you want. I was asked what I wanted and I am very pleased with my choice. Thank you! Lamont went out of his way to make sure I was a happy camper. He does have your back.....he can take him for his word. Thanks everyone; big thank you to Lamont. This dealership is great. From the moment i walked in to buy my 2015 GTI, Lamont Johnson, the salesman I worked with, made me feel welcome. I told him which car I was interested in and he took me straight to it and we went for a test drive. Lamont let the test drive go for much longer than any other I had ever been on, which I greatly appreciated. Lamont showed me every feature on the car in detail. When we got back to the building I knew I wanted the car, but I wanted to get my fiance's approval first. She was at work and it was a busy day so it took me awhile to get a hold of her. Lamont patiently waited and didn't go to any other customers while we were waiting, he even made me a sandwich!! My fiance wanted to talk in person about getting the car, but she didn't get off till five, so at 4, Lamont and the management let me take the car home to Ames so I could show it to my fiance. She didn't actually get off till 6 and Lamont said not to rush the car back, instead, they let me use it for the weekend!! When me and my fiance came back on Monday morning, we both wanted the car but she had to get to work at 11, Thomas Clyce got our paperwork done quickly so she could get to work on time, he also got us a great rate! When I left the dealership they filled my tank full tank of gas. This was a great experience and I will definitely deal with Lithia and Lamont again!! Would for sure recommend to a friend! I came into Lithia VW as a customer needing service on a vehicle i purchased elsewhere. While waiting i met Mr Lamont Johnson. Lamont and his colleagues made my experience buying a new car as smooth and simple as possible. I went in for an oil change and was able to leave in a car i absolutely love. With an interest rate a third of what i was paying. And a warranty that takes care of any worries. The best part of my experience was the people that represented your company. They went above and beyond and treated me not as another sale but as a friend. Thank you. Had a wonderful experience. Found the Golf TSI I was looking for, and drove it home that day. Lamont Johnson was our sales person. I had called him that morning to see if they had the car I wanted. Took it for a test drive and now it is mine. Thanks so much Lithia. Des Moines Native, #CycloneNation, On the side I customized and design athletic footwear for NFL, NBA, and MLB athletes. Enjoy spending time with my Wife and Son. In depth passion for all genres of music. Also in my spare time I coach youth athletics. Trey was great and helped us find the perfect car. Listened to us and what we wanted in a car and prices and met all of our needs. Super friendly and kind. I would highly recommend!! Came in to trade in my vehicle, got a little less the I was looking for but I think I found the perfect vehicle for me. It's the right color, the right amount of miles, the right price. Trey was great, super nice guy, found out he went to college near my home town and had a lot in common. Couldn't be happier that Trey helped me find the car I wanted. Trey helped me find a new sportwagen. This is my first car and I was really uneasy going in. Trey made me feel extremely comfortable and like he wasn’t trying to trick me. I would definitely recommend coming to shop for a car with Trey. Happy with our new Jetta. Our salesperson Trey was very helpful, informative and helped us get the deal we wanted. Also Dwayne was great in finalizing the sale and with all the paperwork! Lithia is an extremely great dealership. I was greeted as soon as I entered through the door. Trey helped me find the perfect car for me. He is very sweet and I would recommend anyone looking for a car to stop in and see him! Trey was extremely patient and eager in helping me select a vehicle. I’m very picky but he never let up his positive, can-do attitude. He worked with other members to ensure I got the price that fit my budget and was extremely informational the entire time. Absolutely amazing customer service and I never felt like I was buying a car because everything was so seamless, easy, and fun. I HIGHLY recommend Trey and will be sending all of my friends and family his way for future purchases. Trey was friendly and professional. He worked with me and my busy schedule to make this a fast process. It was an overall great experience. Trey was really good to work with and he got us in the car that we wanted and kept it at a reasonable price. Thank you!!! This was my very first time getting a lease. When I walked in, Trey greeted me right away and got to know me and what I was looking for. He showed me 2 different trims of the 2019 Jetta and helped me figure out the finance plan for me. They really worked hard to get me the exact car I wanted! At most dealerships the sales persons main objective is shoving you into a car and treating you like you're just a paycheck. Here at Volkswagen they are extremely friendly, flexible, and work to your needs. They treat you like a real person. Trey is super awesome hes friendly and helpful. I told him what I wanted was unachievable by any means and honestly I doubted everything he told me. He's a man of his word and made sure what I needed got done for me. We walked into the dealership looking at some used cars. Treyall was very easy to work with and knowledgeable. He was very personable and truly wanted to earn our business! My car got “forgotten about” to get fixed. Took over 2 weeks to send my car BACK to get paint touch up AGAIN because it was done awful the first time and the paint didn’t match the rest of my car. I had to physically go in to tell them it was taking too long and came to them telling me my car getting fixed got lost in the shuffle. Awful customer service. I worked with Trey Burkhall to purchase a new Tiguan, and it was a great car buying experience. I had to make much of the deal remotely via phone and email, and Trey was flexible in working around my schedule and when I was in town. He was knowledgeable about the vehicle I purchased, and had the options all set up for me before I was even done signing the paperwork. Great experience and I wouldn’t hesitate to work with Trey or recommend him to friends and family. Got my new car today if anyone comes to Volkswagen I recommend Trey Burkhall he was so helpful made me feel comfortable and helped me find the perfect vehicle thank you so much!!! Made the time getting the car very efficient and was very patient with us. Also went out of his way to my mothers job from the dealership to help her get some paperwork signed. Shows the amount of passion and the level of work ethic he possesses. 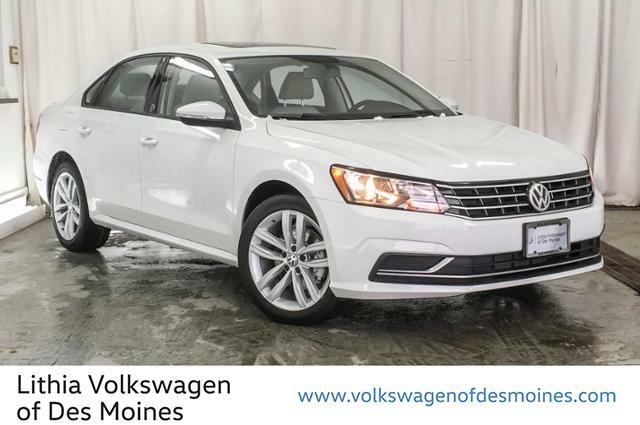 Just like to leave a great review for Volkswagen of Des Moines. Great people to work with. My salesman was Trey Burkhall and he did everything to get my sale. I had a great experience working with Trey. I went to the dealership looking to buy an Atlas. Trey as polite, understanding, and he did his part to work with me in order to come to an agreeable deal. Trey was understanding of my needs, he listened to my requests and was excellent in his replies. Car buying is always a little difficult, but Trey did everything to make this deal enjoyable. I would recommend reaching out to Trey if you're looking for a VW. The salesman we worked with, Trey, was very friendly and personable during our car buying process! He took the time to show us different versions of the 2019 Tiguan to ensure we purchased the car that fit our needs! He also took the time to make sure all of our questions were answered. I would return to this Volkswagen in the future! Trey did an outstanding job finding the right car for us. Very helpful & personable! Caleb worked hard to get us the right price for our vehicle. Great teamwork between them & an overall great experience here at VW Des Moines! We had such a great experience. Did not feel pressured to make a purchase and both Trey and his manager were more than willing to work with us to get us a deal that worked with our budget. Thank you!! We will be back! Trey was very helpful and knowledgeable. Definitely recommend working with him and this dealership. He worked hard to find the right car and got the price where I needed it also. I would have to express the service that they offered me was exceptional, but I would have to disagree on the paper work end of it, i felt that i was rushed through a lot of things and alls they wanted was the sale. Some request I had were planned, for example full tank of gas, and 300 dollars knocked of my car payment, once the paper work was ran up none of these two planned ideas, instead they put the paper work back to the same listing amount and still sold me the car for asking price. So incredibly thankful for Trey at Lithia Volkswagen in Des Moines! He got me into the perfect car and was kind and reasonable! Highly Recommend! I knew that I wanted to buy a year old, low miles Atlas so I emailed about one they had and Georan responded right away to confirm availability. We were greeted by Trey when we came to test drive the vehicle. He was knowledgeable and helpful. Even when I wasn't sure it was the exact interior and exterior color I wanted, they said that they would work with me to locate exactly what I wanted. We decided to go ahead with purchasing the one they had in stock and worked with Trey. I was really impressed with him - he's honest, hardworking and even helped move my car seats in freezing weather. Dwayne helped me with all of the paperwork and financing. He was a joy and I probably could have spent all day chatting with them both. Not something you often say about negotiating a car purchase! Most importantly, I was impressed with how they treated me as a woman. They didn't defer to my husband during discussions about features or pricing. It was a great experience and I definitely recommend them both. We got a nice car at a good price. Smooth process with no issues at all. It didn’t take a long time either. Thanks. Everyone was very attentive and helpful. Great buying experience, we got a very good car at a very good price. Would reccomend this dealership to others. Great guy! Straightforward buying process! Trey is very friendly and hard working. He is focused on giving the customer a great experience and doing everything he can to earn business. The Sale was Great. Service after the sale was bad. The salesperson Trey was outstanding and there were no issues with the sale of the used car. There was a VERY minor (but safety-related) repair issue so they were going to hold the car for a day or two until they had the 5-10 minutes to fix it. A few days turned into a week and communication was terrible. I called to ask if the tech could simply check the check engine light code while he was doing the other fix (something any autozone will do for free) and he refused, telling me I'd have to ask a salesman to ask him to do it. I was also told multiple times that I'd be called back and I was not. Also, they could not tell me the VIN of my new car when I asked for it for my insurance company. Finally, they told me to come in and pick up the title but when I called, I was sent to the Acura business office, where they told me the title would be sent to the county. The ridiculous disconnect between sales and service really ruins the otherwise good purchase experience. Two wings that should work together to maximize sales and sales after the service actually hate each other, and the customer gets caught in the middle. And I still don't have my car! Our car shopping experience could not have been any easier! Trey Burkhall was friendly, listened to our needs and was able to answer all of our questions. His customer service was wonderful! I really enjoyed working with Trey. He took his time with me and allowed me to test drive as many cars as needed to make my decision. I was a bit frustrated by the financing part. I think next time I will secure my own financing before going shopping. When we purchased our new car, Trey was very helpful, informative, and did not pressure us. He made sure we got the price we wanted. Dwayne handled the financial end and everything went smoothly. We love our new Jetta. Good to see a familiar face when we walked in the door! Brian was professional, knowledgeable, friendly and made us feel great about our purchase. I went in to look at cars & buy if I found something I liked. They found something I liked & got me into it. I was more than please with the customer service I got. Willing to work with you and find exactly what you’re looking for! Salesman was great and gave me multiple options to make it happen. Understood my timeline and they were very easy to work with. Great customer service - everyone was very professional - made the sale quick and easy! It was a good experience and easy transaction. I appreciate the quick process. Lithia VW has an excellent group of people ready to help you with whatever you need. They are friendly and very helpful. Make you feel welcome and they also make sure that you are getting /buying what you really need in a car, safe and reliable. I have been coming here for more than 5 years and I am veryh happy. Of all the lithias I could go for service ,I like this one. Ok experience. Caleb is a great salesman to work with. Very friendly. Sales manager Dwayne was ok. I felt extremely rushed filling out my paperwork for the purchase. It was past closing time so I understand, but that wasn’t my fault. The customers in front of me took forever. Wish I would have gotten more for my trade in , but that kind of stuff is common. Multiple inquiries into my credit occurred though, which I get was unnecessary. That negatively effected my credit score. Very nice dealership inside though with decent amenities. Overall decent experience with the exceptions of the rushed paperwork and credit inquiries. The car shopping process at Lithia was a painless experience. They found the perfect car for my needs, and had it to me within 24 hours. When we first went in we were not sure of what type of vehicle we wanted. The sales team showed us some different options and talked to us about what would best meet our needs. We are very happy with our final decision. Had some difficult times but got through to the end. Car was represented accurately and served my purposes for three years. Never had problems with the car. Great deal on my Jeep! Our salesman worked hard to get us in the Jeep we wanted for the payment we needed. Happy with the deal and love my Jeep! Same as I stated above, I would return to Lithia to have service and or repair work done on my VW Atlas . Mechanics are well trained and thorough. I worked with Caleb to buy my 2013 Nissan Rogue. Great experience beginning to end! Initially reached out with interest in the car I found on their website. I came in that day for a test drive, they weren’t too pushy and answered all of my questions. Got a great value on my trade in, and with a little negotiating I got the car at the price I was hoping for! Had a tire pressure warning light pop on after driving it off the lot, and Caleb got me in the next day to take a look at it (no issues with the vehicle). Would recommend working with this dealership for sure! Best car buying experience ever! The team that assisted us was professional, courteous, friendly and completely prepared to ensure a quick and seamless purchase! We will recommend Lithia as the dealer to go to! We enjoy this dealership and all the services offered by the caring staff! We LOVE our 2019 Jetta and high suggest getting one from the awesome sales team! Brian provides the highest level of service making car buying easy and stress free. He worked with us to find the right vehicle to meet our needs, was proactive to make the pickup and closing process as quick as possible, went over all the features of the vehicle, and follows up after the sale. I recommend Brian for anyone looking to buy a vehicle! My experience at Lithia could not have gone smoother. The employees and service were exemplary! I would highly recommend working with any of these professionals. Had a phenomenal experience with Caleb. Did my research and comparative shopping before I came in, so I had plenty of questions and hurdles for Caleb to jump through. Test drive was very relaxed, negotiations were done with respect, and timelines were met. My car was ordered from Missouri initially, until the deal fell through between dealerships. Caleb was able to secure the car I ended up purchasing from Indiana, where it was shipped to Lithia, only one day later than I had initially planned for the first car. As a car guy who has tried a slew of manufacturers and dealerships, new and used, I have to say my experience with Caleb and Lithia was right at the top. I’d definitely recommend! First time brand new car buyer here. Randal Crabb was great at getting me in a nice 2019 VW Jetta at an affordable price. Very great service all around. Manager Scott was very helpful and friendly as well. Caleb helped us find the perfect car for our growing family. Everyone involved in the process was so helpful and friendly. We're so happy with our purchase and would go back to Lithia again in the future. From my initial visit to the Lithia VW website to driving away with my new car, Morgan and Dwayne had answers to all my questions. Morgan seemed more like a friend than a car salesman and was easy to work with. I am happy with the deal they gave me, and the financials worked out the way I needed them to. Some of the wait times to get pricing information from managment seemed excessive, my overall experience was very good. I was honestly shocked about how helpful and friendly and respectful the staff was. They listened to what I had to say and they did try and sale me some extra stuff but when k told them I'll did not want it they stopped. Everyone was very friendly and helpful. Brain and Dewayne were very patient with us and very informative. I will never buy another car from anyone else. Great experience and awesome customer service! Your salesman was a helpful as all get-out. You have a great dealership in Des Moines Iowa. You make a person feel welcome and just wanted to thank you for helping me get my new car. I enjoy it very much. I can't say enough about your successful team and how much they care. Thank you so very much. I went in not knowing what to expect. Im a Maryland transplant and normally my Dad would assist me with buying a new vehicle. Randy joked I could pretend he was my dad and he would guide me as best he could. He worked closely with me and listened to what I wanted. In the end I left with a new car. He has assisted me with the after sale services I purchased and made it all seamless. Dwayne was fun and nice to work with through the financial aspect and paper work. They were both like dealing with a family member or friend more than a stranger or like other dealerships that try to force you into something. Brian Braak, was always proactive in providing us with clear and thorough information and ensuring that we were completely comfortable with his answers. When clarification was needed, he always responded patiently and clearly. Dwayne Hill explained and went over very carefully about the lease process. in a few words sales and management team where very straightforward and worked in a hassle free manner that we really appreciated. OUTSTANDING TEAM!!! Very please with how I was treated. Salesman was great, management team went the extra mile to make the deal happen and the finance guy was quick and a funny guy. Overall a very good experience. Brian, Scott, and Dwayne did a fabulous job with getting me setup in my new Jetta! Thank you for all of your hard work, I appreciate it! They did a good job on my car but what I asked them to check they didn't but I'm ok with the work they did..
Everyone was very friendly and easy to work with. Brian was very knowledgeable and did a great job explaining how everything on the car worked. I'm very pleased with the people that work there. Very professional and helpful, they make you feel welcome and help you the best they can. The sales staff was great to work with and very knowledgable. They made the experience as painless as possible and got us in and out as fast as they could. A non aggressive, friendly dealership. Trey is a good sales person. Felt like he worked hard for us. Dwayne was also great to work with. I had Brian Braak as my sales guy. And let me tell you. He is the best! He is patient, personable and he really cares about his clients! The best sales guy I have ever met. Lithia over all was a great place! The people are friendly, atmosphere and comfortable and clean and they really are knowledgeable. Dwayne was our financer and was also very patient(we had our toddler with us) and kind. He explained everything in detail and was even able to get us a better deal than originally planned! Computers were down but I wish the whole sales experience would have a little quicker. Overall the experience was good just wish they could have been a little quicker. I told the sales person I wanted to pay cash for my car, I was told that I could not and was forced to take out a loan. Even though I will be paying off the loan very soon I don't think it is a good business practice at all. I like the new car, but I probably would go to another VW dealer in the future. We very much enjoyed purchasing a car at VW Lithia! The sales team and financing team made the process very easy and we were able to pre-shop online which was nice. I would like to offer my praise to the service personnel at Lithia VW in Johnston. The ease of making an appointment, and their ability to keep me informed about the progress and status of the work being performed helped me keep to my schedule of things that I was in DsM area to get completed, as I am from outside the metro area. Also, the technician, Jonny Rankin, is well qualified, thorough and highly recommended. My time was spent very well at Lithia des Moines, cant explain how excited I was to get a new car! Everyone there was great, easy to work with and very knowledgeable. I will come back every time I buy a new car! This was my first car I had to finance and they made it so quick and easy! I love my new car and will go to them for any future purchases! LITHIA VW has very knowledgeable and friendly sales and service personnel . I would not hesitate to return for future work on my Atlas. Amber S. is very personable and easy to talk to and answered all questions about what is going on with my car. After looking at other dealerships, the VW Atlas has everything we wanted in a vehicle. We need lots of legroom, stowage space, dependable vehicle, great service and sales teams...just to mention a few reasons for our VW Atlas purchase. I couldn't be happier. Great customer service from every employee I interacted with! Everyone listened to what I was interested in and we found the right match. Very smooth process start to finish. I aways feel as though I'm being treated fair and never rushed or bullied into a purchase. Mr. Hill in sales and Mr. Cameron in finance are very knowledgeable, honest and easy to work with. Dwayne and Roger did a great job helping me purchase my new Jetta. I thought the whole process went smoothly and they were so friendly and helpful! I appreciate it. Thank you! His reply is prompt and I could buy the car smoothly. I recommend my friends him as a good dealer and good person. Thank you again! I hate filling out feedback or reviews! The sale was quick and efficient. The price was ok. Dealership was good, and clean. Friendly, and very knowledgeable. Dewayne Hill really worked with me to get the best deal with my credit situation. He's very friendly and personable. A very nice guy. I appreciated dealing with him. Worked with Dwayne on purchase of a 2011 Toyota FJ Cruiser. Fair price and overall great sales experience with Dwayne and all the staff at the dealership. Would recommend to anyone! Great place to buy a car! Dwayne Hill was great to work with. He was genuine and kind and he made my wife and I feel at home the entire time! The title says it. I highly reccommend this dealership. Of all my dealings with all the different companies and industries I have, Lithia VW of Des Moines has the best customer service of anyone I've worked with. Go there. Knowledge.... Express your needs....and budget!! Stand firm! From start to finish Dwayne Hill made my experience memorable. Drive away with a white new 2017 VW Passat and couldn't be happier. He explained every detail of my new car and most importantly listened to what was important to me. He got me financed when no one else in town could. I am now a loyal customer for life. Thank you Dwayne! Dwayne was very easy to work with. He wasn't pushy and he knew what I was wanting. I had actually met him on another visit in the dealership and I liked him then, so I made sure I asked for him when I went in to get my new car. The car buying experience was good excluding the financial side. The only complaint that I have is that the financial department ran at least seven (7), yes seven, separate loan hard inquiries for my credit. That dropped my overall credit scores from 84 to 103 points depending on the bureau. I have seen this complaint submitted in reviews for Lithia in the past. If you come to Lithia be sure to ask who and how they are submitting loan requests! I bought a used VW Golf from this dealership in August and I've had nothing but problems with it and I have had to put in over $2000 worth of necessary repairs. Every time something goes wrong, even though it is obvious...there is a $140/hr diagnosis charge which has never taken less than 2 hours. The shuttle hours are much less than the average 8 hour work day and my car has never been done in less than 3 days. During my last oil change they came up with over $1500 worth of needed repairs and marked them as URGENT. A second opinion said these were unnecessary for at least another 30,000 miles. New to the industry! I am excited to work for the leader in the automotive world, Volkswagen. Eager for the opportunity to work for you! Feel free to come in an experience why we are number one! Andrew was patient with my decision making and worked hard to get my monthly payments within my budget. He was knowledgeable about the vehicle and quick to respond to my correspondence. When my brand new vehicle had a malfunction, he understood my concerns and worked hard to resolve my concerns. Andrew and Caleb worked hard to get me the best deal on the desired vehicle. They were great to work with, friendly, and strives to achieve the customer service and rates I was looking for. Would highly recommend this dealership! Andrew was pleasant and easy to work with! He was quick, efficient and patient. Definitely recommend this great experience! Super excited for my new Atlas! Andrew was great. I stopped in for servicing on my Golf and walked out with a Tiguan. I was interrupted several times by outside parties and Andrew was very patient. Highly recommended. They did a great job. I absolutely love the Atlas I purchased and had a great experience! This is my 3rd purchase from this dealership and I would highly recommend to others. Andrew did a great job. He really went to bat for me to get me where I wanted to be. Will definitely buy from him and Lithia again. This was my first experience ever buying a car and visiting a dealership. Andy made it a great time and really easy. I told him what I was looking for and he found the perfect car for me and my family. Very nice person to work with and can tell he really cares about and enjoys his job. Great dealership and an even better sales team. I recently purchased a vehicle from Lithia and my salesman, Andrew and the Sales manager were extremely accommodating-The entire staff is great to work with from sales to finance. I am looking forward to a long relationship with Lithia and would highly recommend! Andrew was very helpful in finding the perfect car for me! They all were very professional and polite during the whole process. For a new guy, Andrew was very thorough and knew his products. He has a great sense of humor and a bright future ahead of him! Would recommend him to anybody! I grew up in the small town of Perry, IA until I moved to Johnston to attend highschool where I graduated. At 21, I moved out to Humboldt California where I spent the last 10 years and started working for Lithia. I wanted to move home so I transferred Lithia stores and now I am working here! I am excited to be home and selling Volkswagen. In my spare time I like to go disc golfing with my dog and friends, I like cooking good food, and I like to go see live music anytime I can. Those are all big reasons I am glad to be home because Des Moines has tons of opportunity to do all of those things. I really like selling Volkswagen cars because I not only get to meet and get to know a lot of different great people, but I also get to find them the car that fits their lifestyle and needs perfectly. All these things make me very happy to be back home! Cheers! They were kind and welcoming. Answered all questions, and helped us with our problem effectively and efficiently. I don’t remember the gentleman’s name in the service dept, but he made sure I was taken care of. First time buying a car from a dealership. Everything went very smooth. I love the car and had great service the whole time during my visit! We were looking for a vehicle for my youngest son and had been comparison shopping for a few weeks. We have spent hours in other dealerships trying to get a fair price and going back and forth with sales representatives going in and out of managers offices and playing the numbers game. Caleb made purchasing the 2018 Jetta in less than an hour start to finish an outstanding experience., We will be back for another vehicle! Great inventory, and very nice sales staff. I worked with Morgan and Dane, and his sales manager. I never felt like they were being pushy with my decision to buy a car. In addition, I felt like they were transparent with our negotiation process. I'm so pleased with the purchase, I'm trying to find the excuse to add another VW to the garage. I have been in the automobile industry for over 30 years and every day I look forward to learning something new. I have made many friends and will continue to look forward to meeting and taking care of all your automotive needs. Let me know what I can do to make your car buying a special experience. Brian is great to work with. No pressure and very knowledgeable. He made the car buying experience easy and quick. I would recommend working with him if you’re in the market for a vehicle. As a recent transplant to Des Moines, I had little knowledge of the dealers in the area; however shortly after submitting an online inquiry, I received a very welcoming and friendly phone call from both Georan and Brian. Brian was a great salesman to work with. His knowledge and experience in the industry are very reassuring, and is a great negotiator as well. He really does a good job of getting to know the customer and is a great communicator. Definitely recommend.